Made 17 years before his feeble 1986 attempt, Battle Of The Commandos makes only the slightest of efforts to go through the motions of the “misfits on a suicide mission” flick. For his part, Lenzi makes only the slightest of efforts not to make the viewer nauseous with his abusive use of the zoom lens and whiplash-inducing panning shots. Battle Of The Commandos then becomes just as much of a suicide mission for the viewer as well as the scuzzbags that Jack Palance’s Colonel MacPherson ends up with in an operation leading up to D-Day. We’re given only the briefest introductions to his team and the only thing I could remember about any of them was that one of them held the record for being held in solitary confinement and another was a wimpy American who constantly question MacPherson’s tactics in completing the mission. I don’t know what war he was fighting in, but sometimes you’ve got to shoot people in the back and rough up some French gals to ensure that liberty triumphs over fascism. If we don’t, the Nazis will have already won! Or something! Palance is the only thing remotely worth watching this movie. He affects a Scottish accent which rendered him incomprehensible much of the time, but when you could make out what he was saying, he was most likely calling his superior officer names, threatening to kill him, or threatening to kill the guys on his suicide squad who periodically expressed reluctance at going along with whatever crazy scheme the deranged McPherson came up with. To his credit, MacPherson did engage in about ten seconds of soul searching near the end of the movie where he reminisced about how he used to have a wife and ideals, but then it was back to his private war with the evil German colonel Ackerman and MacPherson’s determination to destroy the giant rail gun the Nazis were going to use to hamper the D-Day efforts. Private wars are always welcome in these sorts of things. It gives our hero an excuse to have haunting flashbacks to when he and his arch-nemesis previously confronted one another, generally resulting in the good guy’s family, platoon, or favorite dog getting killed while he watches helplessly. The movie can then be structured so that shots of our hero advancing toward the mission goal is intercut with scenes of the cold, calculating bad guy insisting to his superiors that his mortal enemy is going to single-handedly defeat the Fatherland while the clueless superiors pooh-pooh our villain’s concerns. And by the time everyone realizes he was right, guys like MacPherson are hijacking trains, killing Krauts, and blowing rail guns sky high! That’s pretty much what goes on here. MacPherson’s last platoon was wiped out and through a ten second flashback that shows Ackerman killing his guys as they stumble through the desert, we learn that we are guaranteed a scene at the end of the movie where MacPherson will see Ackerman by himself on the battlefield and scream “Ackerman!” at the top of his lungs before shooting him down! That’s really about the sole reason to stick with this film, unless you have some weird desire to watch a model of a rail gun explode. 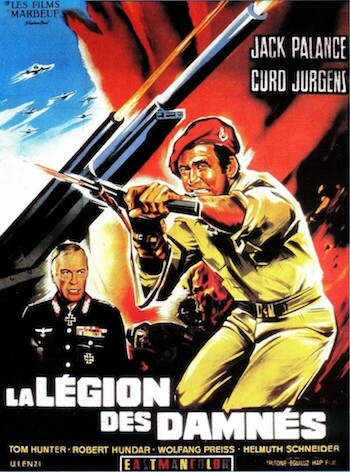 An Italian World War II movie like The Inglorious Bastards works because among other things, it has great action. The action in Battle Of The Commandos while maybe not minimal, is at most routinely bland leading into the climatic rail gun assault that isn’t all that climatic. There’s a lot of our commandos shooting and getting shot and a truck or two blowing up, but Lenzi stages it all so lazily it merely comes off as repetitive and dull. How many times do we need to see guys running and ducking behind stuff during shootouts? And even if you have to use models in a big action sequence like Lenzi does with the rail gun, it doesn’t mean it has to be crummy. Look at any number of Antonio Margheriti‘s movies or better yet, the epic model train explosion in The Inglorious Bastards! Still, Battle Of The Commandos is not without one of those moments all Italian trash movie fans slog through these things in search of. After Palance takes over a German bunker, he answers a phone call from Ackerman and pretends to be a German soldier. While using his super thick Scottish accent! Only sign up for this mission if Palance threatens to kill you. And even then, think long and hard about it.